With so many different pieces of equipment that go into creating a security system, it can be tricky to figure out what each one does. To help you better understand your security system, we’ve created a table with our top 10 home security company picks from our home security systems reviews and which pieces each company offers. Below the table, you’ll find our definitions of each piece of equipment so you better understand its function. >>What works with ADT equipment? >>What works with Vivint equipment? A CO detector sounds an alarm if it detects a dangerous level of carbon monoxide. If you have a professionally monitored home security system connected to your CO detector, a monitoring center agent will be notified if your detector is ever triggered. This means you’ll still be taken care of if you don’t hear the beeping from the detector because you’re not in the room or you’re asleep. Biomimetic sensor: Gel changes color when CO is absorbed, triggering the alarm. Electrochemical sensor: A chemical solution covers electrodes that sense electrical current changes when they come into contact with CO, which triggers the alarm. Metal oxide semiconductor: The silica chip’s circuitry detects CO and the electrical resistance is lowered, which triggers the alarm. You should have at least one CO detector in your, home whether or not you have a security system. To be safe, you should have at least one on each floor. If your CO detector sounds an alarm, you should evacuate your family immediately. Check each person for any flu-like symptoms. (This suggests poisoning.) If you notice these symptoms, call 911 immediately. Open as many doors and windows as possible as you and your family head outside. Do not reenter your home until the detector alarm stops, indicating that levels carbon monoxide have decreased to a safe range. Have your home evaluated by a professional so they can check all your fuel-burning appliances and other items that may emit CO. To get the best CO alarm, check out our best carbon monoxide comparison article. The control panel is the main component of your alarm system and is typically one of the first (if not the first) devices you set up for your security system. The control panel communicates with each sensor, camera, detector, etc., and sounds an alarm when a device is triggered. It then communicates with the monitoring station to alert the security company. For some systems, the keypad may be included with the panel. This is where you can enter your passcode to arm and disarm your system. You will most likely use the keypad on a daily basis since you’ll need to arm and disarm your system when you leave. If your system has a landline connection and someone cuts your wires, you’ll lose connection to your system. In the case of a power outage, you could lose connection for your system if you have broadband. However, with a cellular panel, you are almost always covered, even if the power goes out or someone cuts your wires. 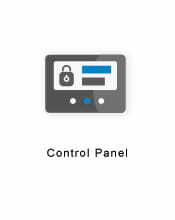 The control panel works in different ways depending on the type of monitoring you have (landline, broadband, or cellular), so the control panel needs to be connected to a phone jack, internet router, or cellular communication device. As we mentioned, the control panel can be a singular device or it can take the role of the keypad as well. If it is a single-use device, you’ll most likely place it hidden away from an entry point. If it is connected to the keypad you’ll probably still want it hidden but perhaps closer to an entry point so you can arm and disarm the system more easily. Do I need a control panel/keypad? All security companies have a control panel but not all have a keypad. Most allow you to control the system from an app or key fob. So depending on the system you have, you may or may not need one. It’s pretty obvious, but door locks lock your door to keep people from getting in your home. Door locks work by the use of a latch or bolt crossing the opening between the doorframe and door. There are two different types of bolts: spring bolt and deadbolt. Spring bolt: These locks are held in place by springs and allows the doors to close (not reopen) when locked. Deadbolt: This type of lock is more secure and stays in place until it is manually unlocked. With both a spring bolt and a deadbolt, you lock and unlock the door by rotating the knob or key in a lock cylinder, which then moves the latch or bolt. There are various types of door locks, including electronic locks, smart locks, and traditional locks. Electronic door locks include a part called an actuator. The actuator connects the bolt or cylinder to a small motor, which allows the bolt to lock and unlock. A smart door lock is a great way to automate your home. Instead of using a key, you can use a card, keypad, or your phone as a remote to lock or unlock your door. For some door locks, you can be time zones away from your home, while others require you to be within a certain range. These are handy for when you have a housekeeper or dog sitter who needs access to your home. You can let them in from afar or grant them access through an app on their smartphone. You can also schedule times for when your home is locked or unlocked (in case you forget), which can be handy for when you’ve left for work and can’t remember if you locked the house. Many electronic locks still allow the use of a physical key as well, but these devices vary so be sure to research carefully if that is something you’d like. Traditional locks are locked by hand. This is done by entering a key and turning it or turning a lock button. Everyone should have locks on all exterior doors. It’s important to keep yourself and your family safe. An unlocked door is an open invitation to an intruder. If an intruder enters your home by opening a window or door and your system is alarmed, the door/window sensor will send a signal to the control panel that it has been triggered, alerting you and the central monitoring station. Door and window sensors come in two pieces: one piece that sticks to the door/window frame and one that sticks to the door or window. These two pieces are installed adjacent to one another and when the door or window is closed, the sensor pieces are joined together. The two pieces have a magnetic connection that, if broken, causes the sensor to communicate with the control panel to notify it that a sensor has been triggered. For the most part, door and window sensors are pretty much the same from company to company. The only difference is sometimes companies offer door sensors and window sensors individually, or contact sensors which can be used for both doors and windows. If they are sold individually as door and window sensors, then the door sensors are most likely a little larger than the window sensors, but they work the same way. Do I need a door/window sensor? These are typically best used on doors than windows since windows are commonly smashed. If your windows are normally locked, we suggest getting door sensors and glass break sensors. Doorbells are pressed to notify you that someone is at your doorstep. The doorbell button is connected to a bell in your home that rings when it is pressed. A doorbell that is connected to your home security system can notify you when someone is at your front step. Some doorbells have built-in cameras and with others, you can install a camera above to see who’s at your door. Some have motion detection to notify you when someone is within range. When someone presses your doorbell (or is detected within range) you will receive an alert on your phone. If there’s a camera, you’ll be able to see who is there. And if your doorbell has two-way voice, you can even talk to them. So if the delivery person has a package for you, you can tell them to leave the package on your doorstep. Do I need a doorbell? A smart doorbell is an optional component to your home security system. If you prefer having this smart feature, we say go for it. Currently, Vivint is the only company in our top 10 with a smart doorbell, and Link Interactive has a smart doorbell, but it does not have a camera built in. Other companies offer outdoor security cameras that can be placed by your front door, but no others offer an actual doorbell. You can also take a look at our list of the best doorbell cameras currently on the market. Fire alarms typically include smoke and heat detectors in them. So for the sake of this article, we are going to include them into one. However, please note that this is not always the case and it’s important to check your equipment to see what it detects and senses. As the name suggests, these detectors sense fire, heat and smoke. Security companies are now including fire detectors as a way to automate your home. These are connected to your system to notify you and the monitoring station when heat, smoke, or fire is sensed. There are three types of fire alarms: ionization, photoelectric, and dual sensor. We cover all of these in our best smoke detector article. Ionization fire alarms create an electric current between two metal plates. When smoke enters the chamber, an alarm sounds. Photoelectric fire sensors have a light source in an electric sensor positioned at 90-degree angles. When light enters, it normally misses the sensor. However, when smoke enters the chamber, the light scatters and triggers the alarm. Dual sensor fire detectors include elements from both ionization and photoelectric sensors. Do I need a fire/heat/smoke detector? These devices should be in every home whether they have smart capabilities or not. A flood sensor does exactly what it sounds like: it detects if there is any excess water. If excess water is detected, an alert is sent to the monitoring station (or you) that there may be a flood. For the most part, flood sensors are all the same. They alert you in the case of excess water in your home where that sensor is located. Do I need a flood sensor? While a flood sensor isn’t a must, it’s definitely suggested. Flood sensors are typically placed near water heaters since this is the most common place for a flood to occur. These sensors are also placed inside or next to basement sump pumps. That way, you are alerted about the issue before the water reaches your basement and floods it. They are also sometimes placed behind washing machines in case a hose breaks. A freeze sensor, or low temperature sensor, detects when temperatures approach freezing. This can help keep your pipes or other parts of your home from freezing and can alert you to an improperly functioning furnace. Many freeze sensors use negative temperature coefficient (NTC) thermistors. Thermistor is a combination of the words thermal and resistor. The NTC thermistor helps determine the temperature reading. This is an important part of the freeze sensor. The trigger temperature can vary, but typically it’s around 41 degrees Fahrenheit. Some freeze sensors are made for indoor use only, while others can be used outdoors. Be sure to check the flood sensor before you purchase it so you know where to place it. Do I need a freeze sensor? Freeze sensors are great for vacation homes and can save you thousands of dollars in damages. They can also be used in climate-controlled rooms that have important objects in them. So if you have a home you are away from frequently or a room with valuables that need to be temperature controlled, you should get a freeze sensor. A garage controller is like a door/window sensor but it’s for your garage. You receive an alert when your garage door is triggered. This is great for those days you’re in a hurry to get out the door and you panic that you forgot to close the garage door. Typically you’ll get an alert that you left your garage door open and you can close it with the push of a button. A garage controller allows you to open and close your garage door from your security company’s app. All you have to do is log in to your app and press the open or close button. It works similarly to a smart door lock because they both use a phone to lock or unlock, or in this case, open or close the garage door. The equipment is similar to a normal garage controller where you have the remote clipped onto your visor. Install a device onto your garage door and that’s it. Do I need a smart garage controller? These aren’t absolutely necessary, but they can be very handy. Glass break sensors detect when glass is broken, specifically from your windows. A glass break sensor detects the vibration and specific sound frequency generated when glass breaks. These sensors are armed even when your system is set to Home mode. So keep in mind that if you ever drop a glass you may trigger an alarm. The typical range for these sensors is 20 feet, so one sensor can cover a lot of ground. However, doors and walls can decrease the sensitivity of these sensors. Glass break sensors are typically installed on the opposite/adjacent wall from windows or on the ceiling. Be sure to check the range for your sensor so you install it close enough to the windows. Do I need a glass break sensor? Glass break sensors are an important component of your security system because if a burglar breaks through a window the window sensor most likely won’t trigger it since the sensor wasn’t pulled apart. However, a glass break sensor would sense this and immediately alert you and the monitoring station. So if you’re trying to choose between a window sensor or a glass break sensor, we suggest a glass break sensor. When an image sensor senses motion it takes a snapshot of the view and alerts the monitoring center or sets off the alarm. An image sensor is a motion sensor with a camera built in to it. If a subject passes the image sensor within range, the image sensor takes a photo of the view. Some image sensors are pet-friendly so they won’t snap photos of your dog roaming throughout the house. However, this can depend on the weight of your dog. So if you have a bigger dog, it may trigger the image sensor. Do I need an image sensor? Image sensors can reduce the number of door/window sensors you need, which are common components to a home security system. So if you have a space with four windows, it may be more cost effective to purchase one image sensor instead of four window sensors. Indoor cameras are meant to be used inside to record any activity in your home. They typically are not weatherproof, so if you place it outside, the camera may get damaged. Most indoor cameras need to be plugged in to a power outlet to work. This can limit where you are able to locate the camera. Fortunately, most indoor cameras don’t have to be wired back to the control panel so you don’t have to worry about that. But if you want to have the camera positioned on a wall, perhaps in the corner of a room, you may need to place a couple screws in the wall. Keep in mind the length of your power cord when you do this. Some features you’ll want to take into consideration are night vision, field of view, audio capabilities, pan/zoom/tilt, and video resolution. If your camera doesn’t have night vision it will be useless in the dark, so night vision is a must. If you have a large room but the field of view is only 45 degrees and there are no pan/zoom/tilt capabilities, you’ll probably need another camera or two to monitor the entire room. Common places for indoor cameras include living rooms, offices, and garages. They typically don’t record footage 24/7, only when motion is detected. Many companies have the ability to let you view your camera’s footage through their app so you can check on your home while you’re away. Do I need an indoor camera? Indoor cameras give you valuable insight into your home. If someone breaks in, a camera can capture footage that you can turn over to the authorities to help catch the culprit. They can also let you check on loved ones at home while you’re away, or to just see if everything’s fine while you’re on vacation. An indoor camera is certainly useful, but it’s not necessarily an integral part of the home security system. A key fob (also called a keychain remote) is like the remote control you use to lock and unlock your car except it’s used to alarm and disarm your system. The key fob for your security system also has a panic button that sounds a loud siren to alert the monitoring company that there’s an emergency. There is also a home button which sets your alarm to Home mode, meaning the system is armed but only for entry sensors (door/window sensors). So if a door or window is opened, you are alerted. The range on these devices can be up to 500 feet. Most key fobs are the same and have four buttons: arm, disarm, home, and panic. Do I need a key fob? We recommend having a key fob because it helps you alarm and disarm your system. Many home security systems come with two key fobs and often times you can add another key fob to your system so multiple family members can each have one. These are commonly called smart switches, which allow you to turn small appliances or lights on and off remotely through an app. If you connect a controller to a light you can turn the light on and off from afar. If it’s connected to a slow cooker, you can turn it on a couple hours into your work day so your dinner is ready when you get home. Or, if you’re like me, you can connect your coffee pot to it and turn the switch on when you wake up so by the time you get to the kitchen, your coffee is ready. Be sure to have your actual appliance turned on because if the appliance is set to off and you turn the switch on, it won’t flip the appliance switch to on for you. Most smart switches are the same. You plug the smart switch into a power outlet and then plug your light or small appliance into the smart switch. Then from your app you can turn the switch on and off. Do I need a lights & small appliance controller? A smart switch is not a necessity, but if you travel often, we recommend them. The controller will allow you to connect a light to the switch and turn it on and off remotely so it looks like someone is inside your house. 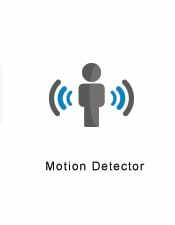 A motion detector does exactly that—it detects motion. It’s one of the basic components to a home security system so most security systems have motion sensors in their equipment lists. Motion detectors/sensors protect an area of your home by creating a space that cannot be entered without an alarm being triggered. So if someone (or sometimes even a pet) enters the zone, the motion sensor will alert the control panel. Motion sensors are often used in rooms that contain lots of valuables (e.g., living rooms, offices, etc.). If someone entered your home through a door or window that didn’t have a sensor on it, the motion detector could still pick up the activity (if the intruder walked through the monitored area). The degree angle and distance can vary with each motion detector/sensor, so it’s important that you check yours specifically so you know what area your sensor can monitor. Most companies that have motion sensors allow them to be placed on a flat surface or mounted on the wall (either by screws or a heavy-duty sticker). The sensors are typically wireless. Do I need a motion sensor? We recommend having at least one motion sensor in your home. When you’re placing your motion sensor you’ll want to be careful. Some pets trigger motion detectors so check with your company to see if there is a size limit. Also, try to avoid placing motion sensors by windows. Light from the sun’s movement throughout the day could trigger your sensor causing a false alarm (this has happened to me before!). An outdoor security camera helps surviel your property and alerts you when someone has trespassed. Most outdoor cameras for homes record footage only when motion is detected. However, some record footage 24/7. Outdoor cameras are most often wired but sometimes are wireless. Some features you’ll want to take into consideration when choosing an outdoor camera are night vision, field of view, weather resistance, color vs. black and white, audio capabilities, pan/zoom features, and video resolution. It’s important to determine what you want in an outdoor camera, so make a list of your wants and needs so you choose the right camera. One of the benefits of using these is that many times you can access the footage remotely on an internet-enabled device (depending on the camera). They’re great for when you’re out of town and want to check in on things or when you’re at work and want to watch for a delivery or a service person. Do I need an outdoor camera? Outdoor cameras are often used near garages, entrances to a home, and backyards. A panic pendant is meant to be worn or carried with you at all times. It is meant to be used during an emergency situation but is not limited to only break-ins. A panic pendant can also be used in case of a dangerous fall. To use it, push the button on the pendant, which will then send a signal to the monitoring station. A professional will be in touch with you to see what type of assistance you need. The proper authorities will be notified and you will have help shortly after. It is a small, battery-operated device similar to a key fob. Ideally, the pendant is waterproof so it can be worn in the shower since many falls occur in the bathroom. Do I need a panic pendant? These are commonly recommended for people who are at risk of falling. If you think this would make you feel more comfortable, we definitely recommend this for you. A recessed door sensor is like a regular door sensor but it’s less noticeable. Recessed door sensors consist of two pieces: one placed directly inside your door or window and the other placed inside the frame. When these two pieces separate you are notified or the central monitoring station is notified. Most companies require that your door or window, as well as the frame, be made out of wood so you can drill easily. Since the equipment is hidden in the frame it is less noticeable to a criminal. Door and window sensors are more bulky and can easily be seen; recessed door sensors fit inside the door/window so they blend in easily. Do I need a recessed door sensor? We recommend recessed door sensors over regular door sensors because they are inconspicuous and they typically have good battery lives. Although this does require some drilling, we still think they are better than door sensors. Smart thermostats help you cut your electric bill and help you be more energy efficient. Depending on the thermostat you purchase, it can learn your routine and automatically change the temperature to your preference. Most allow you to change the thermostat from a smartphone app so you can adjust the temperature before you leave work or when you’re on your way back from vacation. Thermostats allow you to regulate the temperature in your home. Thermostats turn your heating or air conditioning on and off to keep your home warm or cool. Some allow you to set schedules while others require you to adjust as needed manually. The Nest thermostat is a smart thermostat that can learn your schedule and automatically adjusts to your preferences after learning your behaviors. Many security companies offer thermostats as a home automation feature. You can control the thermostat from your app and adjust the temperature as needed. You most likely already have a thermostat, but if you want to save on your energy bill, purchasing a smart thermostat is a good decision. The tilt sensor monitors an object and makes sure it is kept stationary. Tilt sensors are commonly used on overhead garage doors. They can also be used on windows that tilt, hatches, sheds, or other objects that shouldn’t be moved. When the object is moved the sensor moves as well, which then sends a distress signal to you or the monitoring station. Most tilt sensors are the same. When an object with a tilt sensor is moved, that movement alarms the sensor. Do I need a tilt sensor? We think tilt sensors are important to put on garages and sheds. These are two areas that people often forget to secure. If a burglar breaks in through your garage door they’ll get into your home in no time. However, if you have a tilt sensor you’ll be notified immediately and will be able to send authorities to your home for help. Is there equipment you want to learn more about? Is there a piece of equipment you’d like included on this list? Be sure to mention it to us and we’ll see to it that it’s added.